I'm not usually one to decorate for Halloween as I much prefer Fall decor. This year, I made a promise to my Hallowen loving husband that I would decorate for Halloween as soon as Thanksgiving Weekend was over. that I thought I would attempt a Halloween wreath. All the materials are from the dollar store, making this another budget friendly DIY. I didn't end up using the eyeballs, so this DIY only needed 3 items to complete! I started by placing the big spider on the wreath as it was the focal point then added the other objects around it. The little spiders came inside the black flowers I found from Dollar Tree. 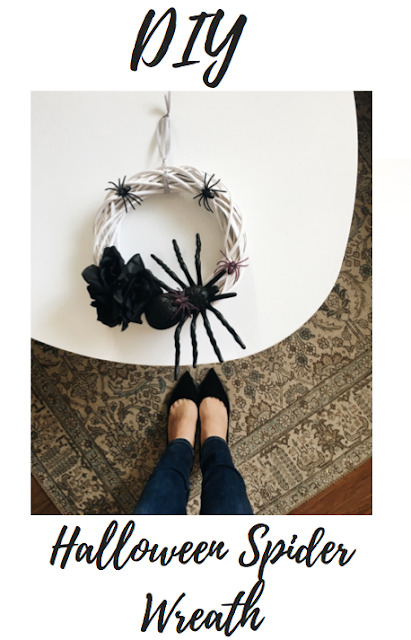 The giant spider and wreath are both from Dollarama. In total this DIY cost a total of $6. To make all you have to do is hot glue the items to the wreath and voila a Halloween Wreath!